Ships within 5 business days. Please allow up to 2 additional week transit time for your item to arrive. 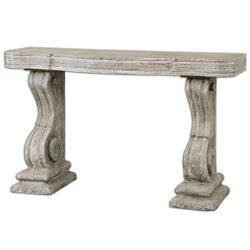 Bring the spirit of a stately French country home with this skillfully shaped console table. Elegant, sloping pedestal legs give a grand, luxurious feel while stone grey, distressed ivory accents bring antique authenticity. The neutral color palette and dually rustic and refined design make this console table a welcome addition to homes of all styles.